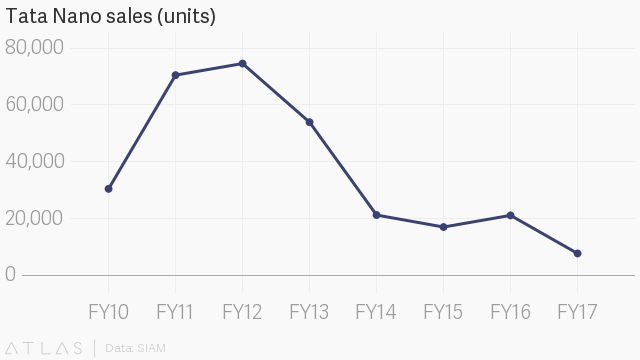 Tata Motors is calling it quits on the world’s cheapest car, following a roller coaster of auto revolution, protests, safety failures, and political turmoil in India. Once selling 9,000 units in 2011, only three Tata Nano cars have been sold in 2018 so far. The company says it will now only produce its vehicle on demand. After Tata Motors built a new factory in Singur, West Bengal in 2006, the Communist Party of India-Marxist tried to convert nearly 1,000 acres of fertile farmland, sparking mass outrage. The fallout saw the CPIM ousted after three decades of rule, forcing leadership changes in West Bengal while Tata Motors moved their plant to Sanand in Gujarat. The Tata Nano was celebrated upon its launch in 2009 as an alternative to dangerous overcrowding on bicycles and scooters. But several fire safety issues tanked sales by 2011.